Bryan Ferry has been recording covers of classic 1920's+ songs way before it became fashion in the past few years. His cover versions are never cheap knock-offs, so it's no surprise his newest project which goes into an entirely opposite direction (or does it), is indeed not the complete disaster it could have easily been. It's obvious it was made in good taste, with love and with a portion of subtle humour. 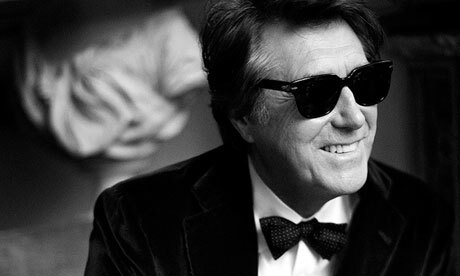 But then this is Bryan Ferry, so I was actually never really worried about this project. Bryan has shown his appreciation and feel for the 20's - 50's pop music over several decades now, therefore him deciding to rework his own compositions, hits as well as as a few lesser known songs, as 20's jazz instrumentals seemed kind of logical and almost obvious. Most of the album works just brilliantly. Love Is The Drug works well as the original hit as it does as a jazz instrumental, and you can still hear the song in it. In some cases the new arrangements are even improvements on the originals - Avalon is a case in point (my personal taste here...Avalon is my least favourite Roxy Music album). The whole album is a joy, it just brings a giant smile on my face and keeps it there for its whole 37 minute duration. It's not easy, picking a few highlights on this sort of cohesive instrumental project, but apart from the aforementioned Love Is The Drug and Avalon, I could mention I Thought or Virginia Plain. I Thought in particular is an absolute delight. I had no idea I could love another version of this song as much as I do the studio version of it which is featured on Frantic. Its upbeat rearrangement is in such a stark contrast to the melancholy of the original it's amusing, but it just works so well. Admittedly, this album is not for everyone. An appreciation for pre-50's music is probably required, as well as being familiar with the Bryan Ferry songbook, which allows you to appreciate the record in all its sometimes hilarious yet tasteful glory. For me this is hands down one of the best albums of 2012. In a year of underwhelming albums and an overwhelming doom and gloom mood, The Jazz Age brings joy, laughs and good music. I'll be damned if I don't take this witty little retro record over 80% of this year's releases. Good review! I really like this album, too!